Contains our livestream recaps from the AoC Intrepid streams. Margaret Krohn is the new Community Marketing Lead for Ashes of Creation. Margaret will focus on the larger tasks, such as marketing, press team involvement, community management, content creator program etc. There will be a Senior Community Manager to handle the day-to-day communication on Discord, Twitter, forums etc. Who this is, will be announced very soon. Castle Siege Maps sneak peak. 2 Castles shown. 6 Classes for Castle Siege announced with short introductions to each. A look at the Node UI window. A glimpse of the Fishing NPC's and UI. A short look at a Caravan quest. Information on how the Stock Market will work. 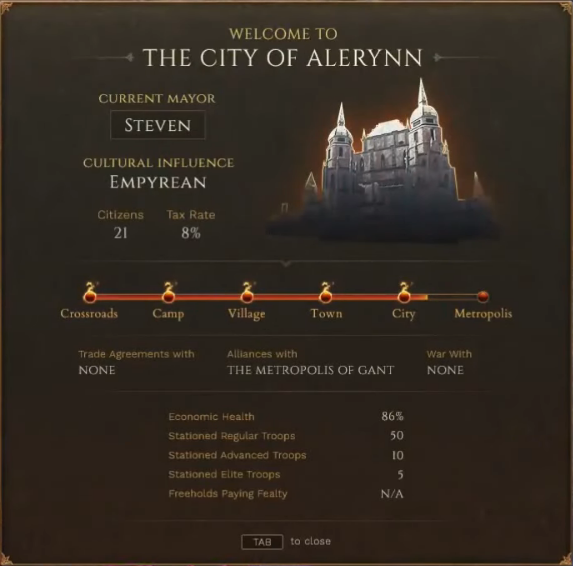 We see the devs spawn into what is a level 5 City Node, Elven themed, filled with NPC's and life. Dec 6th Live-stream recap and QnA - APOC Open Beta on December 18th! Open Beta announced for December 18th 2018! Available to all registered users. All Alpha 1 backers will receive lifetime membership of the 10$ legendary pass. New livestreams showcasing MMORPG development next week and how BR assets are used in the MMORPG. First Alpha 1 Phase 2 gameplay shown. Phase 2 is planned to start in March-April 2019. Phase 2 will be the traditional MMO experience, with progression, node system, open world etc. More info on what is included in this phase, can be found here. Alpha 1 Phase 1 is renamed Ashes of Creation Apocalypse. Will feature the battle royale, castle siege, and horde mode. Will be a free to play side-arena, playable by everyone. Alpha 1 Phase 2 gameplay. This is with medium graphic setttings, but already looking extremely good! Next test dates Friday 9/28 to Sunday 9/30. Will players be able to gift monthly sub time via the referral link program? Intrepid Studios is coming to Europe at Gamescom in Germany (21st August 2018). Name Reservation will be available sometime during Alpha 1 Phase 2 (Hopefully). Offering variable combat modes with testing upto a 100 players. They'd like to provide consistent Battleground testing where players will be able to complete a match and instantly queue up for another to ensure heavy testing of the feature. Focused on Matchmaking. The objective is to test stability with upto 200 players to ensure they have the right values and spawn timers for various mechanics.